On Monday morning, several Israeli army jeeps, and a bulldozer, invaded a Palestinian farmland near Nablus, in the northern part of the occupied West Bank, and demolished a room along with its facilities. 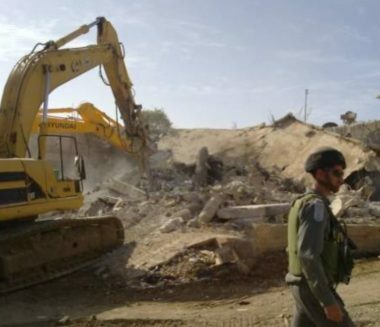 Media sources in Nablus said the soldiers invaded the land in Qusra town, south of Nablus, and demolished a room used by a farmer on his land. They added that the room also contained a small kitchen and a bathroom, and was built on private Palestinian lands, owned by Mousa Ahmad Hasan. The army claimed the room was built without a permit from the Israeli Civil Administration Office, in the occupied West Bank, because it is located in an area that is under full Israeli military and administrative control.